There were high hopes placed in the G20 meeting in Buenos Aires. Most policy leaders were present. In particular, German Chancellor Merkel had her role as a seeker of compromise already fully scripted. With President Trump she was to assure low tariff levels for cars; with Argentina new approaches for debt management; with President Putin discussions on Ukraine. Alas, the discussions and their impact were disrupted. The Chancellor’s ride got there late. When Mrs. Merkel departed from Berlin, plans seemed to be on track. Cabinet members, the German Foreign Service team and a gaggle of journalists had moderately filled up the Chancellor’s official airplane. But after one of thirteen hours flight time, the machine turned around for an unplanned landing. Communication was on the fritz, gas could not be ditched and the subsequent landing back in Cologne/Bonn was heavy. Minor inconvenience, say you. In an era where even the CEO of a U.S. multinational firm in decline like Jack Immelt always had a backup plane accompany him, surely all the German Air force had to do was roll out the spare and fly on. Perish the thought! There is a reserve plane, but it had already taken off homeward bound once the main trip seemed on track. Also, the spare crew could not perform within regulation time limits. The German airline Lufthansa was all out of space for trips to Argentina. Only the Spanish airline Iberia had a direct hop from Madrid to Argentina. Not all passengers were excited when bureaucrats and guards suddenly filled up their cabin. Yet others reported that Mrs. Merkel was quiet, focused and smiled at Selfies. Wagging tongues have suggested that, in light of the harsh electoral decline of her party, Frau Merkel merely got re-acquainted with more popular forms of transportation. Others wonder what Germany’s founding Chancellor Bismarck or, worse yet, what President Trump would have said to this debacle. Perhaps the lack of a plane tossed the European Union, or at least Germany into political turmoil. It isn’t the short term but rather the long-term repercussions, which paint reality. How effective are marketing slogans and expectation dealing with progress and technology, when the country leader’s plane won’t fly? What happens to the brand value of time when the head of government arrives half a day late? How can one be a useful arbiter while not being on location? And all this had to happen just when CEBIT, one of Germany’s largest trade fairs for technology and communication had to close down. Is all this witness to a transition away from leadership? The German aircraft debacle is of major import and impact. 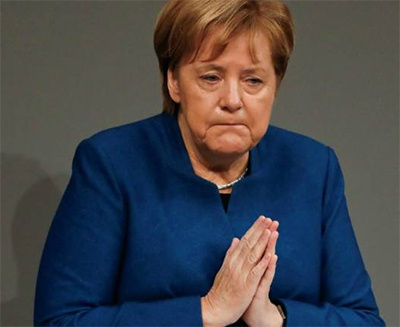 Mrs. Merkel may have become more forgiving to her staff. But even though she nods and smiles more, her partners in international discussions take self-imposed delays very seriously. For them late is late, which undermines impact and efficiency. As to President Trump’s perspective on these events, I think he worries less than expected. First, they help to reaffirm his demand for a substantial increase in European spending on defense. Of equal importance, why should he care about the quality of German planes - he has his own.